This 4.7 mile hike is a steady climb that gives you views of the south and west on the climb up and views of the north and east from the summit. The summit of Furnace Mountain has nice views of Massanutten and of Shenandoah National Park, looking back toward Skyline Drive. 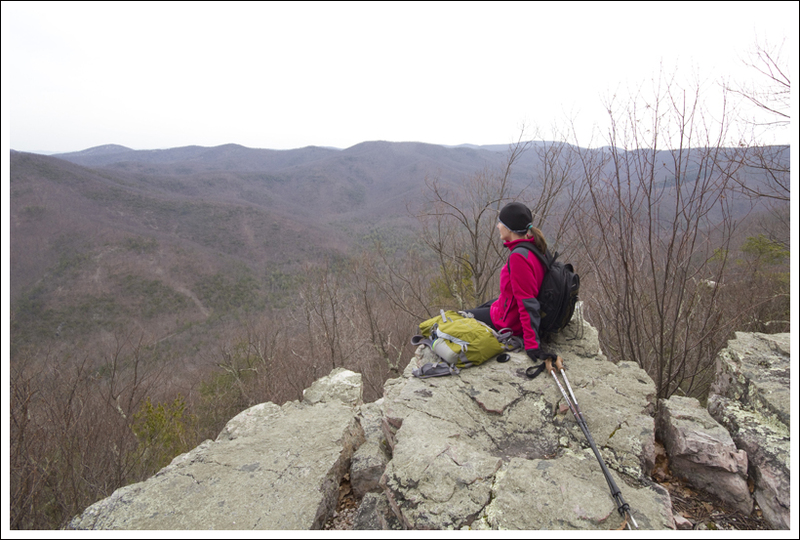 It is amazing to me to think about how blessed we are to have such great hiking in Virginia. 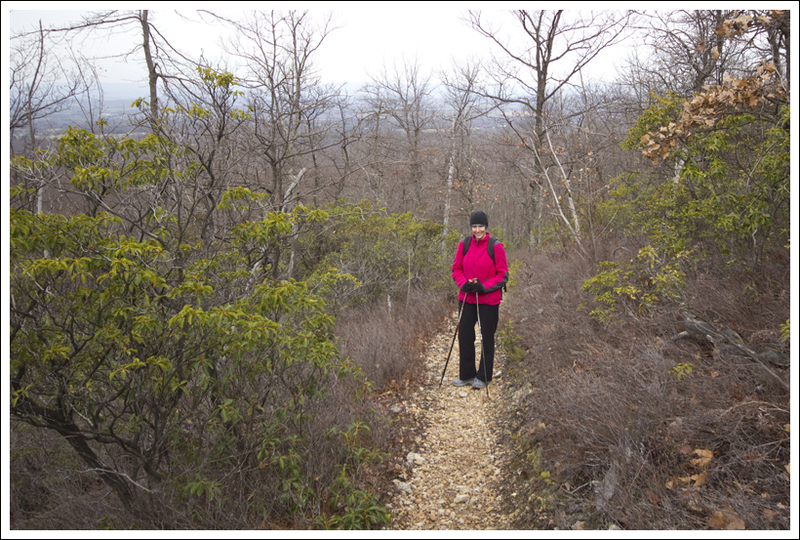 While we have been slowly trying to accomplish the Appalachian Trail through Shenandoah National Park, but we also like to mix in some other hikes. Christine stumbled across a mention of this hike, so we decided to try it out. We were pleasantly surprised by the nice views you get on this hike. Keep in mind, there is another Furnace Mountain in Loudoun County. There doesn’t seem to be a lot of originality in naming mountains sometimes. This Furnace Mountain is named for the Mount Vernon Furnace that once stood at the bottom of the mountain for the reduction of iron ore.
Adam rock-hops across Madison Run. 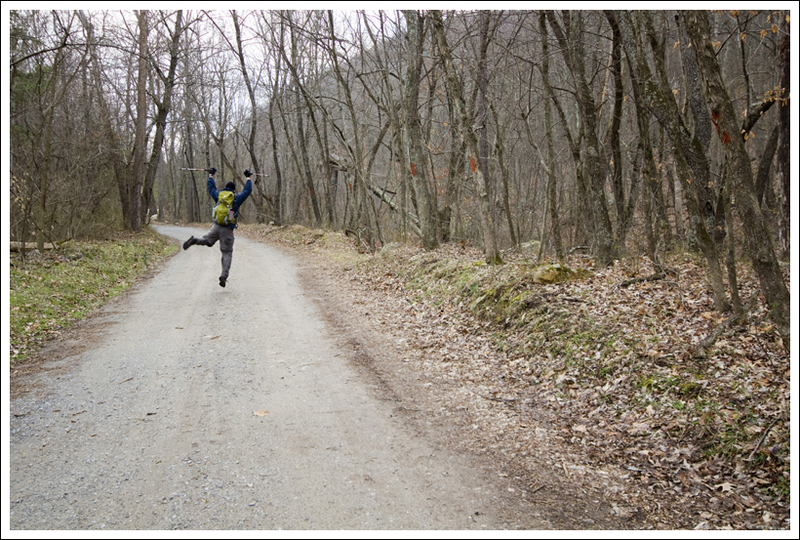 Below: Adam adding some excitement to an otherwise boring fire road; The official start of the Furnace Mountain Trail. 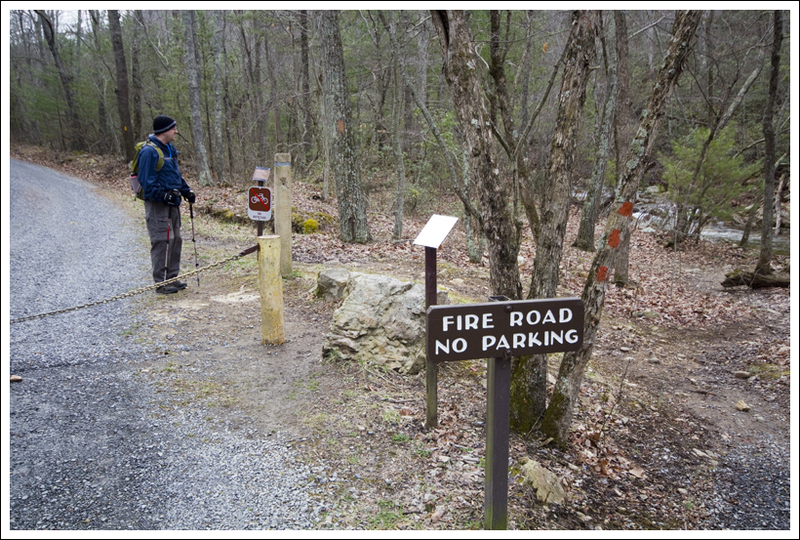 We parked our car at the beginning of the fire road and made our way to the boundary of Shenandoah National Park. As soon as we entered the park boundary, you will see a signpost to the right that denotes the start of the trail. 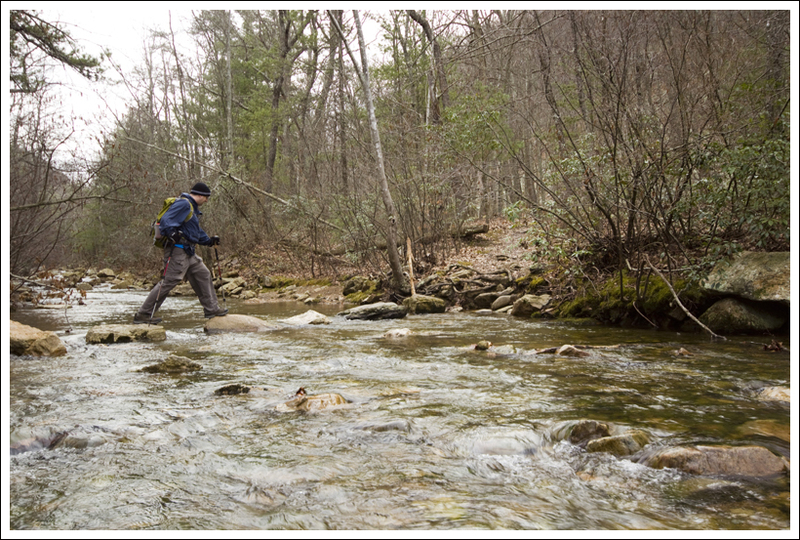 You will quickly come up to a stream crossing of Madison Run that you can rock-hop across. These rocks are sturdy, but can be slick in some spots, so be careful. After crossing Madison Run, the trail turns right and parallels the stream for a short distance. Then, the trail begins climbing up the mountain. There is a constant climb uphill for the entire hike. Around 1.6 miles, the trail comes up to a large talus slope of large boulders which provides an open view of the valley. The trail continues climbing and at 1.9 miles, you reach a post and an intersection with the Furnace Mountain Summit Trail. Take this trail, which continues to climb up. At 2.3 miles, you will reach a campsite at the summit. 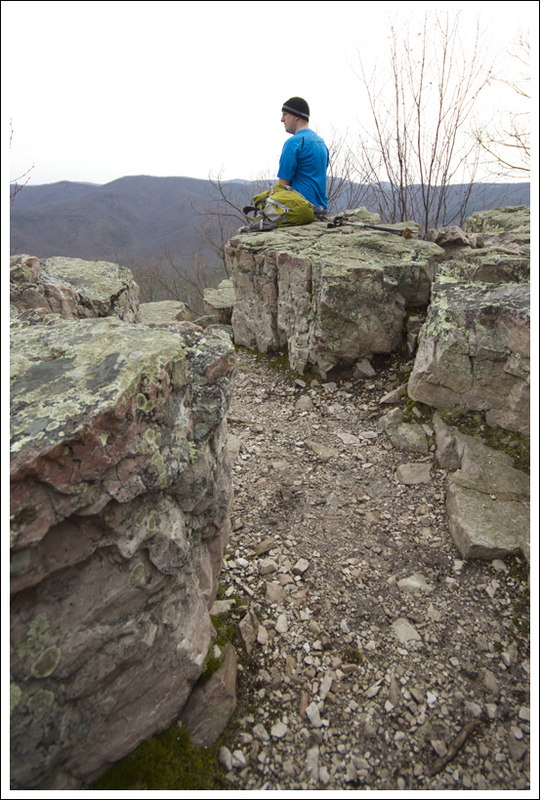 Less than .1 miles is the rock outcropping which gives you the best views on the trail. Return the way you came to make it back to your vehicle. This time, you’re going all the way downhill. Christine hikes on the trail across the talus slope. Below: Adam takes in the view of the valley. Madison Run is not named for James Madison, but rather from John Madison, the first Court Clerk of Augusta County. John Madison’s cousin was the father of James Madison, the 4th US President. Near this location stood Madison Hall Estate. We had debated about bringing Wookie on this trip. He would have loved most of the hike, but would have hated crossing Madison Run. He really wants to avoid water on the trail, so I know I would have had to carry him with his claws digging in to me. He just doesn’t like getting his precious feet wet for some reason. Hiking this trail in the winter gives you views throughout a good portion of the hike. When the leaves come out, you will have more obstructed views except from the talus slope and the rock outcropping at the summit. We were excited at how great the views were from the summit. Even though this mountain’s summit is only at 2657 feet in elevation, it provides some great vistas of the mountains around. If you’re looking for a manageable hike off the beaten path with good views, this is one to try! Adam and I had Friday off work, so we decided to hit the trail for a morning hike. We thought about doing some more of the Appalachian Trail through Shenandoah, but I wasn’t in the mood to drive separately for our car shuttle. I also didn’t want to drive too far for our hike, so I started researching trails close to our home. We’ve done so many of them already that it’s getting increasingly difficult to find anything nearby. Luckily, I happened to stumble across a route up Furnace Mountain with a trailhead located about fifteen minutes from our house. I had been aware of Furnace Mountain before this, but most write-ups I’ve seen cover it as a 13+ mile loop hike (with 3000+ feet of elevation gain) paired with Austin Mountain. I can hike 13+ miles as a day hike, but I usually don’t enjoy it. My ideal length for a day hike is still 8-10 miles. Our trip up Furnace Mountain started off cloudy, and while the clouds thinned out somewhat during the course of the morning, it stayed mostly overcast. That was a bit of a shame, because the views all along the trail are really nice. 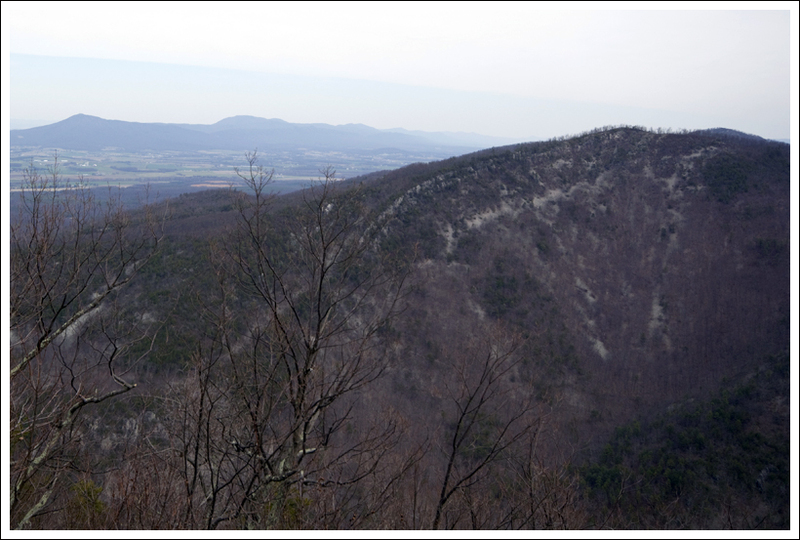 I’m sure some of the views will be obscured once the trees have leaves again, but for the time being, it was great to see views of the Shenandoah Valley along the climb up. The trail was extremely rocky most of the way, and even crossed a neat talus slope. I imagine that this mountain was once towering and majestic, but over the ages, the rocky summit crumbled and rolled down the lower slopes. The climb uphill was steady, but not difficult. The most challenging part was the footing – lots of football-sized, unevenly seated rocks. 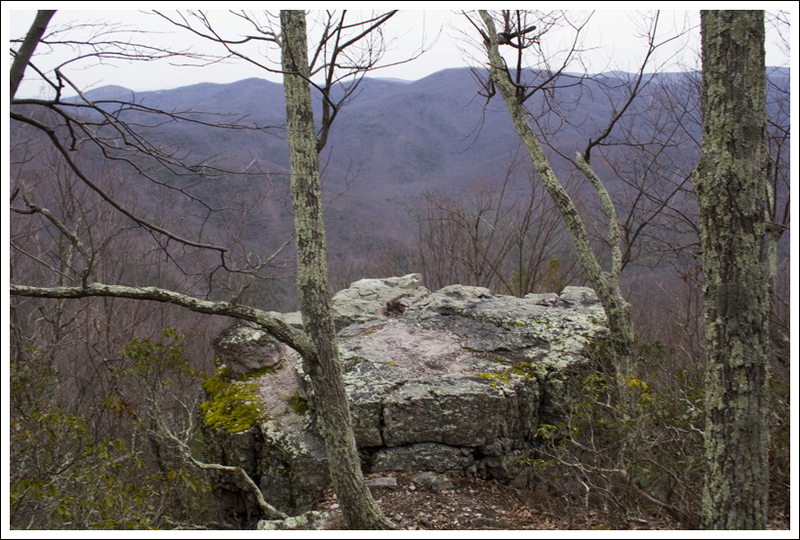 The Furnace Mountain summit trail is a half mile dog leg off the main trail. Along this segment, we passed a campsite with a well-used fire ring. 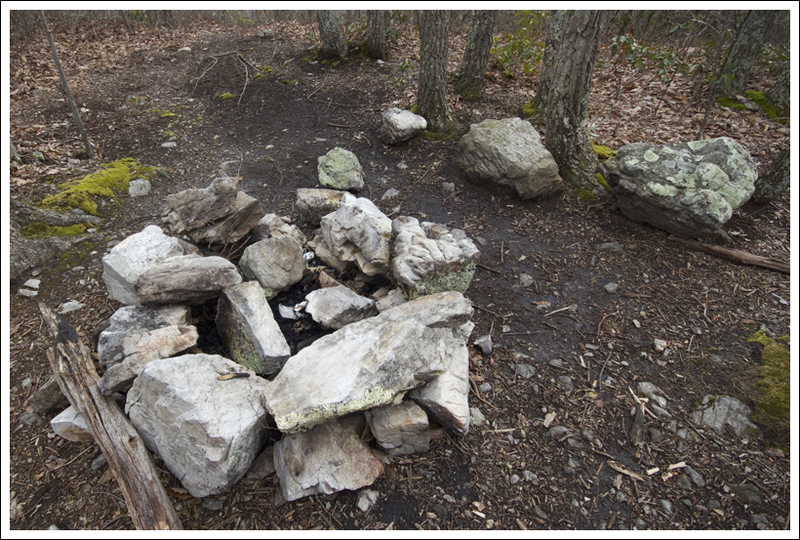 Since Shenandoah does not allow open fires in the backcountry, the fire ring really shouldn’t have been there. I suppose that the park just doesn’t have enough rangers to police illegal fires. 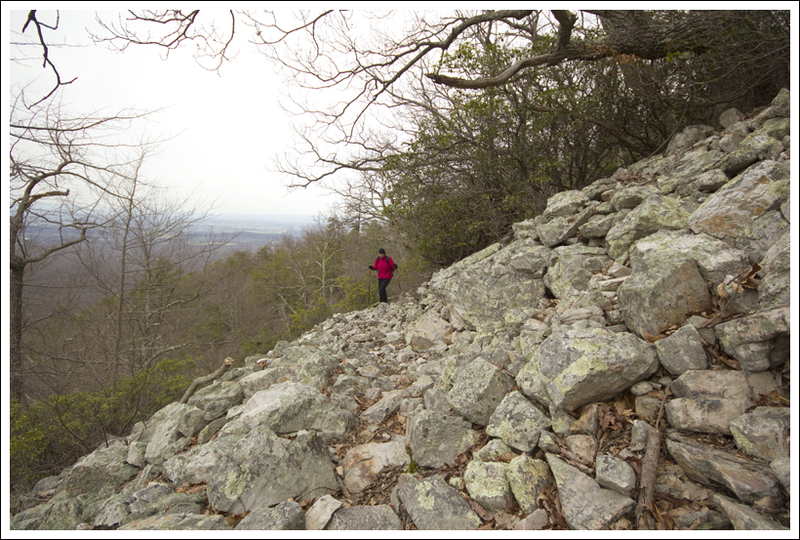 Shortly after the campsite, the trail took a short downhill to a rocky outcropping overlooking the park and the Shenandoah Valley. We could see Massanutten mountain in one direction and a distant snip of Skyline Drive in the opposite direction. In early March, everything is still barren and brown. The dull color paired with the clouds took a little of the luster off the overlook, but it was still very nice. I’d like to see it again in late spring, summer or fall! Christine enjoys the summit. Below: Adam on the rocking outcropping. As you can see the rock is very rugged and jumbled. After hanging out a short while, we headed back down the trail. We made it back to our car in less than half time time it took us to climb up. We practically jogged the whole way down! On our way home, I had really been looking forward to stopping at the Elkton McDonald’s for a Shamrock Shake. We got there… shakes were on the menu… but the stupid machine was out of order. I was robbed! Difficulty – 3. The uphill isn’t too strenuous, but there isn’t much break from the climbing. Trail Conditions – 3. We were surprised at how well this trail seemed to be maintained. The path is a little more open, but does have some rocky sections. The danger would be in going down, since you can pick up speed and some of the rocks may be loose. Views – 4. The views are quite nice, but not 360 degree views. Streams/Waterfalls –2. The trail does go along Madison Run for a short distance. Wildlife – 1. We didn’t really see anything on this trail. Ease to Navigate – 4. As long as you cross the stream at the right point and then make the turn on the Summit Trail, you should be fine. Solitude – 3.5. Typically only popular with the locals, but you may see a few people on the trail. Directions to trailhead: From Elkton, VA follow 340 South. You will see SR 659 on the left. Follow that until it intersects with Browns Gap Road/SR 663. Take a left and follow the road until it becomes a gravel fire road. Park on the road. Continue on the fire road for about .2 miles until you enter the park boundary. The trail marker on the concrete post will be on your right. 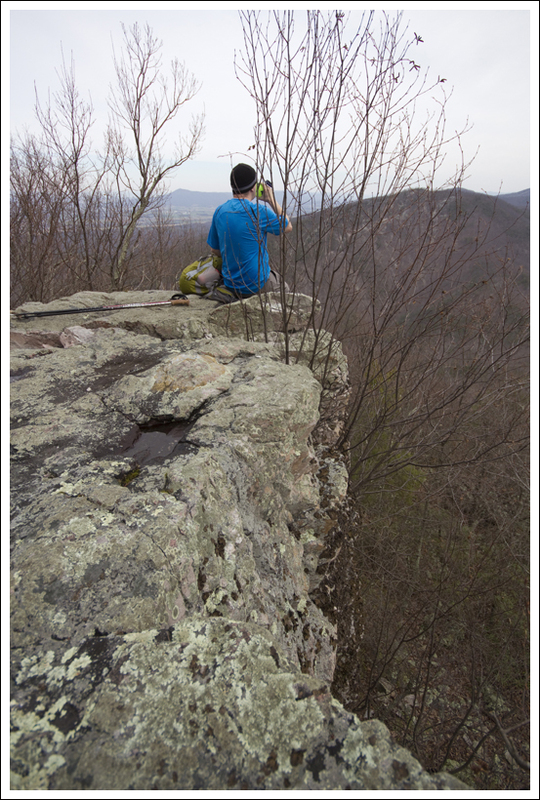 Hiked from Madison Run parking to Furnace Mtn. summit and back with my dog (on leash, of course). Sunny, mid-40s, somewhat windy (great weather!). Regarding wildlife: On the way down, with about a mile to go, there was a startling eruption of coyote screaming to the south, toward the western slope of Trayfoot. I have no idea how many, but it sounded like several. Needless to say we quickened our pace. Didn’t hear or see any other sign, though. I bet that was pretty intense! I’ve been seeing coyotes in the park pretty regularly. I’m wondering if the Rocky Mt fire last spring burned any of this area or how close it came to this hike? I appreciate any response. It’s been a couple years since I hiked that trail, so I can’t give you a recent first-hand report. But, IIS mapping of the incident shows that Furnace Mountain falls outside the affected area (https://inciweb.nwcg.gov/incident/4689/). I think you might see some fire damage in the viewshed, but I’m fairly certain you won’t be hiking through burned trees. I’ve hiked in some of the areas directly affected by the fire, and it’s really not that noticeable anymore. 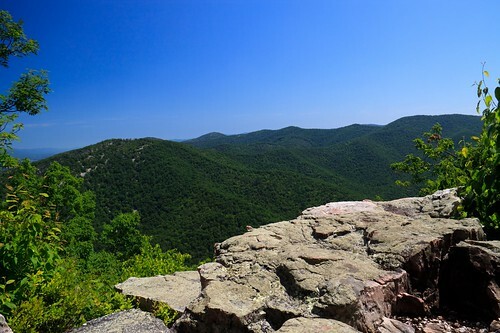 I’m not a big hiker, but I’m planning to hike with a group of friends on some 2 mile hike to Furnace mountain. I also really hate bears, and would not enjoy the sight of one. How likely is it I encounter one here? I wouldn’t say a bear encounter is ‘likely’ as bears want to avoid you even more than you want to avoid them. However, bear sightings DO happen all over (and around) the park. But truthfully, nothing is going to happen if you see a bear. 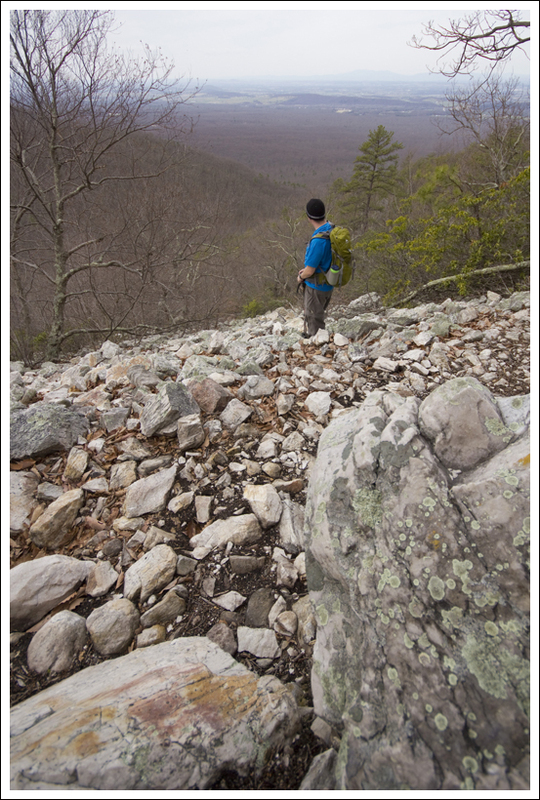 Shenandoah National Park has never had a visitor injured or killed by a bear at any time in the park’s long history. Glad you liked the trail! Making it to the view next time will make it even more memorable. In my opinion y’all missed out! You should have kept going up the Furnace Mountain Trail to Blackrock, then taken the AT north to the Austin Mountain Trail. Austin Mountain has those white scars across its southern face that are really rock slides. The trail traverses them. I did it in early March, and it was awesome! Thanks for visiting, caretaker! That trail is in great shape! We appreciate all the work you do to keep it so nice! Great article! I happen to be the overseer of this trail and appreciated your capturing the highlights of this remarkable little hike. As short as it is, you get elevation, water, talus slopes, great views and remarkable vegetation (the mountain laurel is in its second week of prime); there are also bears, rattlers, ticks and chiggers. I’ve been hiking the trail for about 30 years and decided some time ago to help maintain it. Today, working at cutting back huckleberries, laurel and blackjack oak with the shade and steady breeze felt like working in a Zen garden. I spend a lot of time out there maintaining it, but it is a labor of love. Gives me a nice counterpoint to my work as a psychotherapist. Keep on hiking and writing! I just hiked this with my German Shepherd (he did fine) the other morning and was thinking “who is taking such good care of this trail?” 🙂 Now I know. Thanks! It was a fantastic hike, but takes longer than you’d think for 4.8 miles because of the rockiness and especially the current slippery leaf cover. Won’t trail run it until December, but hope to do the 14m circuit (see description in hikingupward.com) soon. Wow! I’ve got to add this one to the list. Great write up. Discovered your blog through another site, and so glad I stumbled upon it! it’s so well written and I love the varying points of view…you don’t get that on most sights. 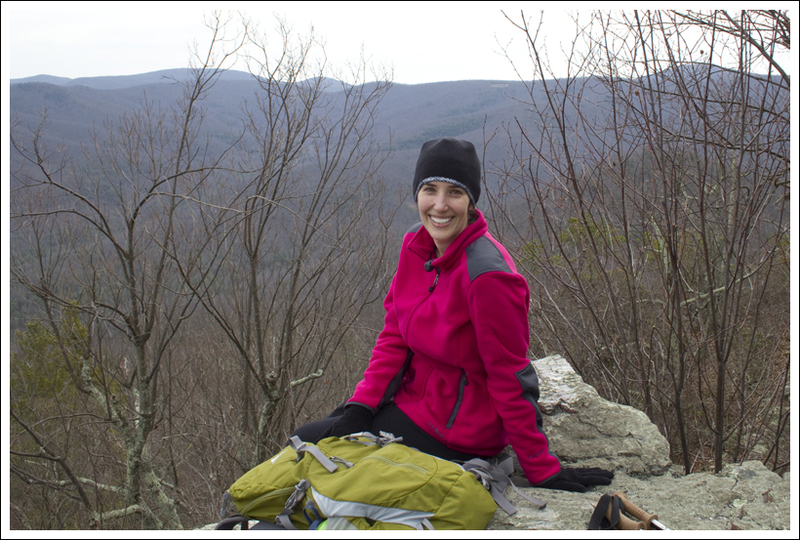 I had a lot of fun browsing your entries…I’ll be sure to bookmark it for future hike ideas. Hey Jason! Thanks for the visit. The summit still has a view in the summertime. I came across someone’s photo from that spot taken in August, and it was still really nice/open! It’s so close to the house, I’m sure we’ll make a return trip when the foliage is nicer. What a pleasant surprise so close to home.That’s a great winter hike. You’re right: It’s clear from just the few pictures you shared this would be a drastically different trail experience once all the trees were budded out! For example, the picture of you on the summit- it looks like there would be basically no view there in the summertime. It’s good to see some activity on your site. There’s nothing better after a hike than a milkshake…..